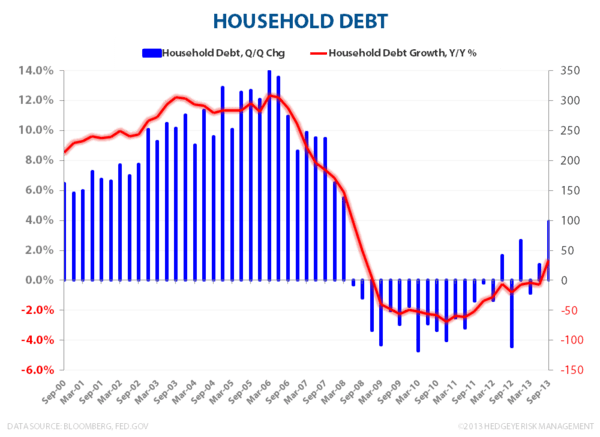 Summary: Adjusted Household Net Wealth is just south of peak 2007 levels, Household Debt-to-GDP continues to decline and aggregate household credit growth went positive for the 1st quarter in 18 alongside sequential increases in both consumer and mortgage debt. A summary review of household debt & balance sheet trends from the latest, 3Q13 Flow of Funds report from the Federal Reserve below. 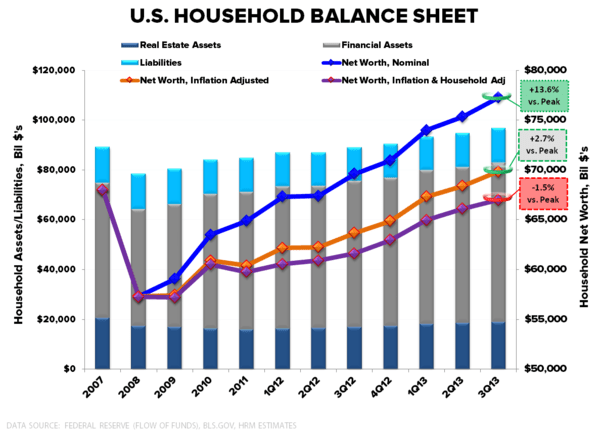 Household Net Wealth: Household net wealth is +13.6% above the prior 2007 peak on a nominal basis, +2.7% on a inflation adjusted basis, and -1.5% when adjusted for both inflation and the number of households. Reported net wealth should continue to advance alongside ongoing home price growth and higher equity market highs. Putting aside the disproportionate benefit and wealth equality implications stemming from financial asset price inflation, asset/collateral inflation and a strengthening in the aggregated household balance sheet should continue to drive some measure of wealth effect spending and support capacity for incremental credit (more below). 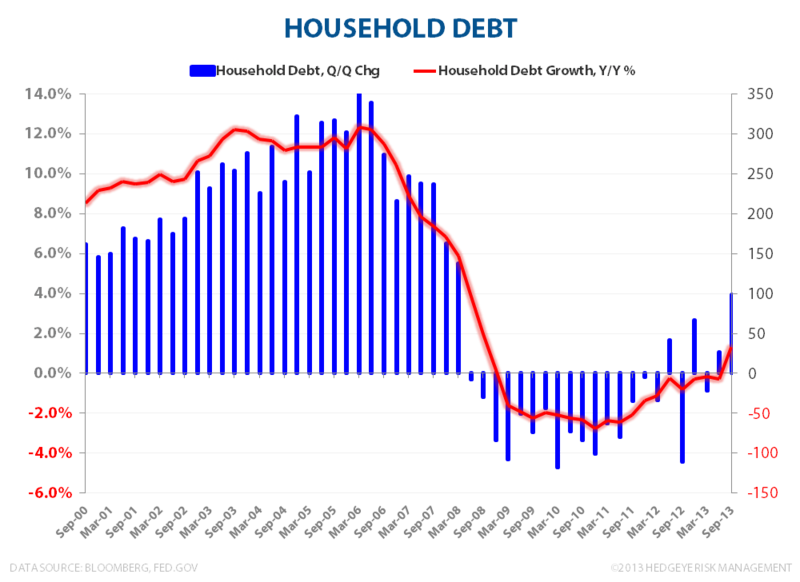 Household Debt-to-GDP: Household Debt/GDP continues to fall as GDP grows at a positive spread to nominal debt. 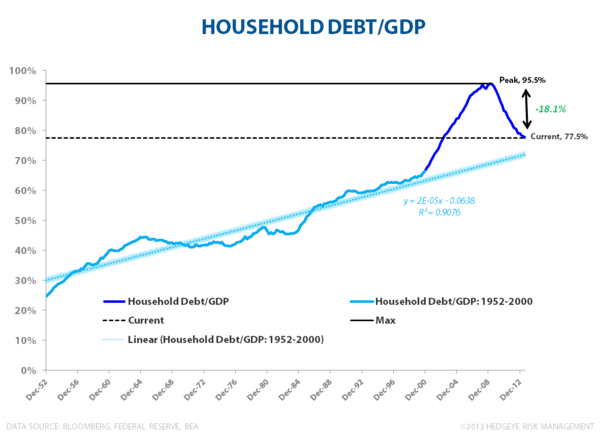 At 77.5%, we’re currently 18.1% off peak 2009 Debt/GDP levels and have nearly retraced back to (1) trend although there still exists meaningful downside to longer-term averages. 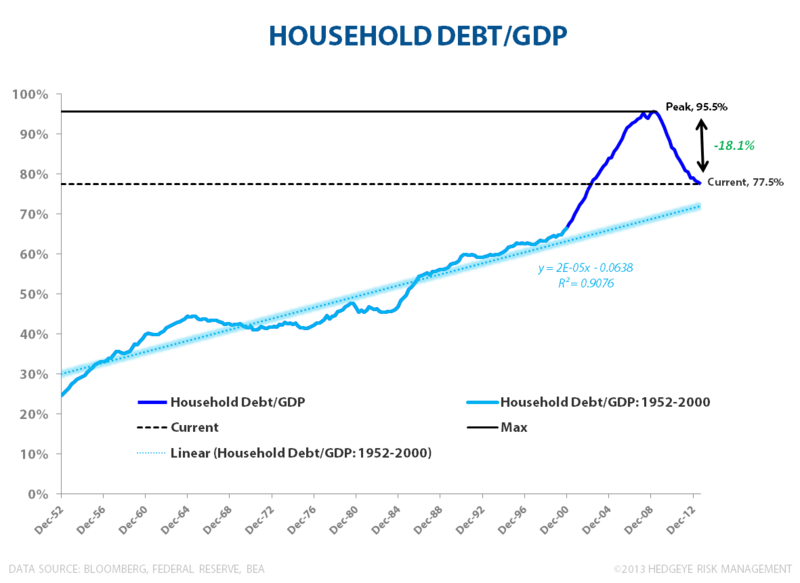 After moving largely in lockstep for five decades, household debt growth went exponential in 2000, decoupling from consumption growth which kept tightly along the path of a second order polynomial – which is just a mathy way to say debt growth exploded but with diminishing marginal impact on consumption growth (ie. 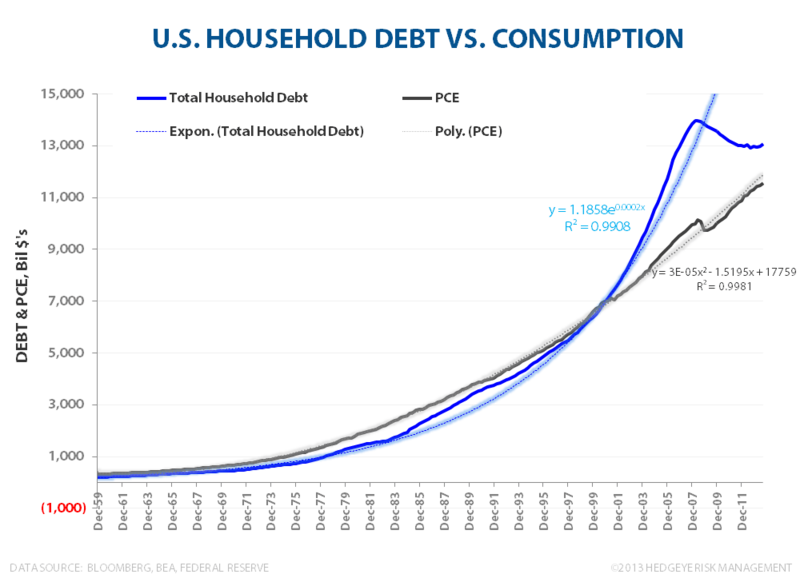 every dollar increase in debt produced increasingly less than a dollar of consumption growth). 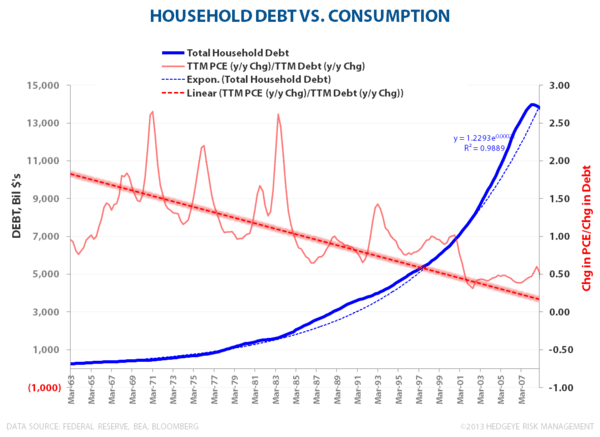 This debt-consumption interplay is a typical antecedent of financial crises whereby incremental debt is used to speculatively acquire already overpriced (financial) assets instead of going towards entreprenurial or productive output/investment. 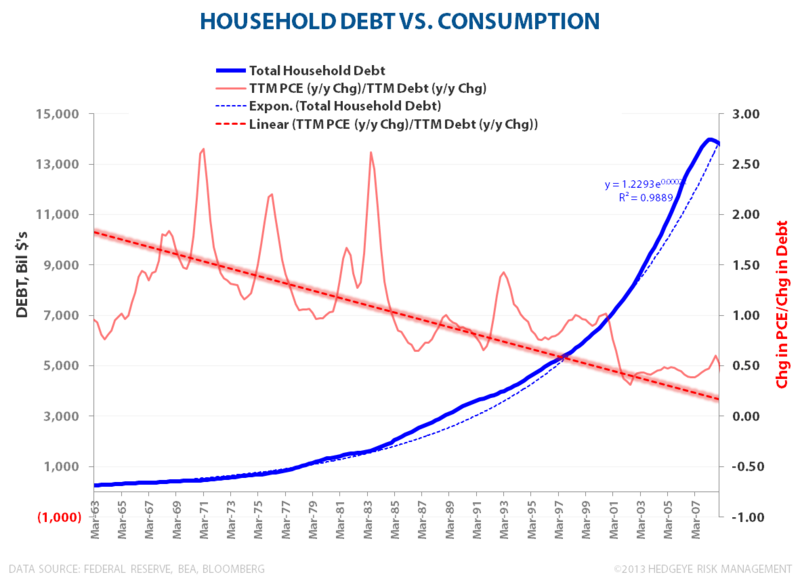 The red, long-term trend line in the second chart below reflects debts increasingly ineffectual ability to drive incremental consumption. 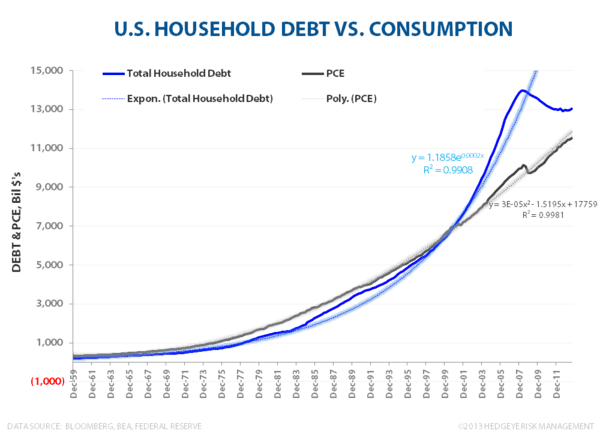 Despite its patent obviousness, that fact that debt growth in excess of income growth is unsustainable remains, perhaps, the most glaring example of willful economic blindness for developed economy consumers and bureaucrats . When growth in credit exceeds growth in income for 30 years and monetary policy becomes impotent as a support at the zero bound in rates, the long-term credit cycle ends with a 2008 style de-leveraging fireworks. 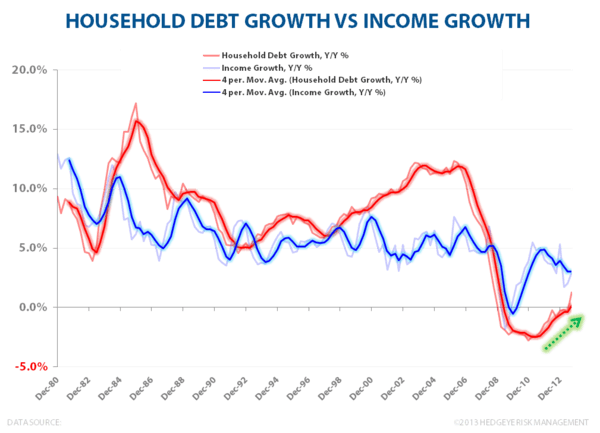 As can be seen in the chart below, in the wake of the financial crisis and through to the present, income growth has advanced at a positive spread to debt growth. With debt growth turning positive in 3Q alongside continued labor market strength and broadly positive mortgage, auto, and consumer loan trends, positive credit growth is set to continue. 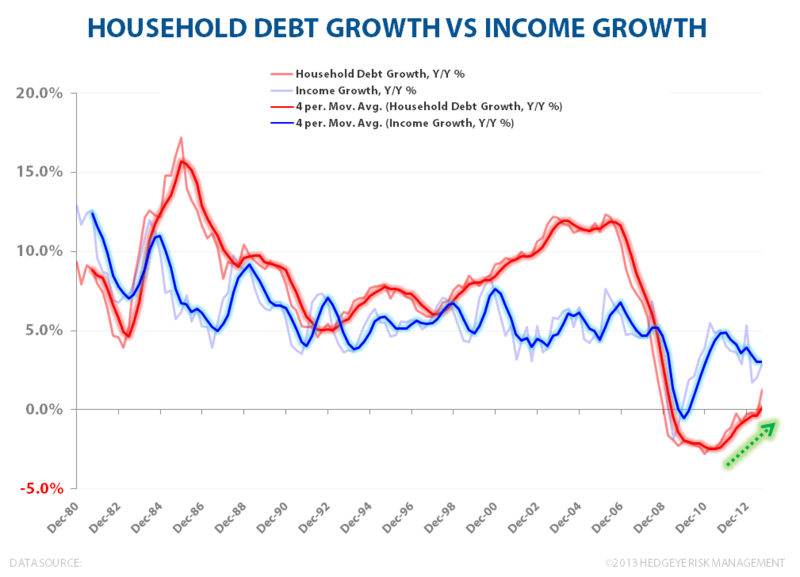 The closing of the delta between income and debt growth represent the upside to credit driven consumption.